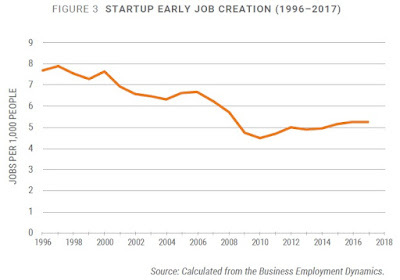 A dynamic and healthy economy will always be undergoing a process of churn: new companies and new jobs starting, but also existing companies and jobs ending. 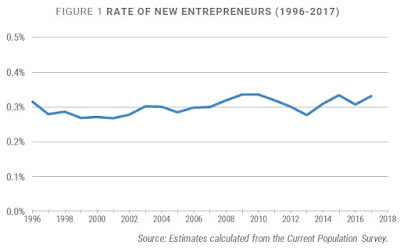 Thus, it's been troubling to see articles about "The Decline in US Entrepreneurship" (August 4, 2014), a lower rate of business startups, and a decline in how much new firms are offering in terms of job gains. 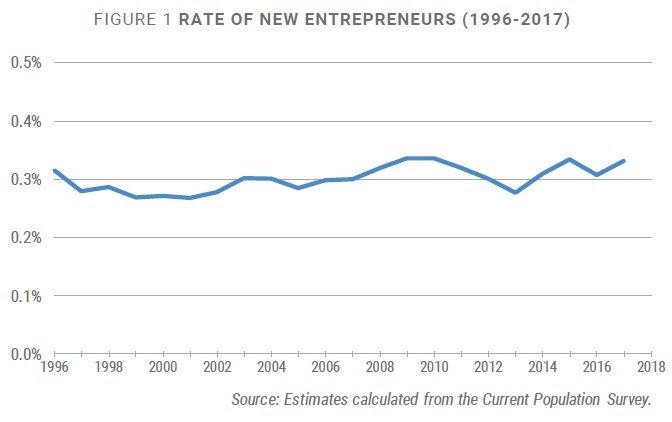 The Kauffman Foundation does regular surveys of US entrepreneurship. Robert Fairlie, Sameeksha Desai, and A.J. 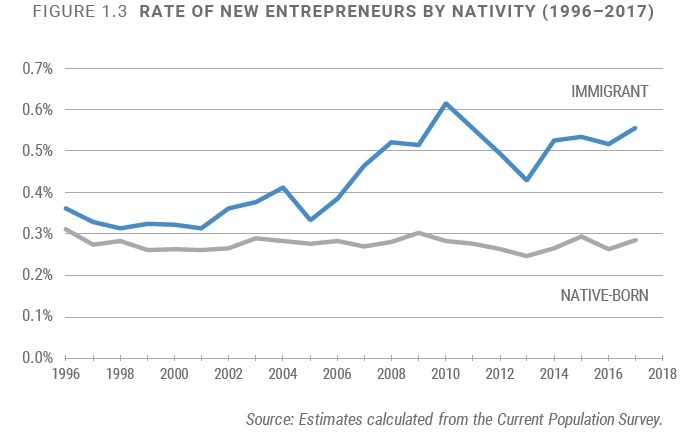 Herrmann wrote up the 2017 National Report on Early Stage Entrepreneuship (February 2019). The report offers some reasons for modest encouragement, but in the end seems overly optimistic to me. In addition: "Older adults also represent a growing segment of the entrepreneurial population: adults between the ages of 55 and 64 made up 26 percent of new entrepreneurs in 2017, a significant increase over the 19.1 percent they represented in 2007." Conversely, these figures suggest that a smaller share of new companies are being started by highly educated workers in their peak earning years. At least to me, this pattern suggests the possibility that a larger share of new companies are aimed at providing income and independence for their owners, but may be less likely to grow and generate substantial numbers of jobs. 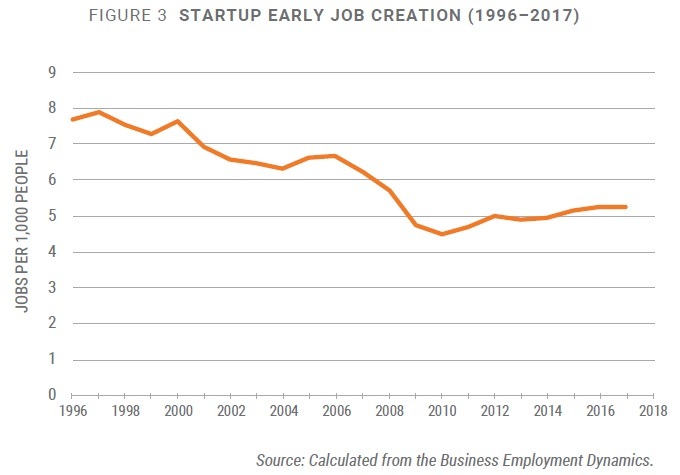 Indeed, the Kauffman report also includes this figure, showing that the jobs per 1,000 people from early startups has been declining over time. The Business Dynamics Statistics is constructed from what is called the Longitudinal Business Database. In turn, this data uses Census data and links the records on individual companies over time. To keep the records of individual companies confidential, the data can only be accessed by qualified researchers through a network of Census Bureau Research Data Centers. However, the website does have a nice data tool for making quick-and-easy graphs of some overall patterns in this data, as well as sector-level and state-level patterns. Here's an example of a figure showing "Establishment birth rates" (black line) and "Establishment exit rate" (blue line). For example, back in the 1980s it was fairly common for the number of new establishments to be about 15 percent of the total number of firms; now, it's about 10%. 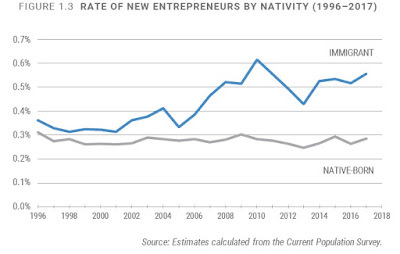 Both rates of entry and exit have been declining over time, suggesting that new firms are having a harder time getting started and established firms are having an easier time staying in place. As another example, here a figure for the economy as a whole from the BDS database on the "job creation rate" (black line), "job destruction rate" (blue line), and "job creation rate from establishment births" (orange line). The gap between the job creation rate and the job destruction rate is the overall level of net new jobs for the economy in a year. Fortunately, job creation is above job destruction in most years, except in recessions. But even in years when the US economy is going well, its churning, changing, evolving job market is commonly in a situation where the 13-15% of existing jobs are destroyed, and a slightly higher share of new jobs are being created. In thinking about US entrepreneurship, the standard concern is that the churning of job market seems to be declining over time. The orange line shows that job creation by new establishments has been declining, too, similar to the finding from the Kauffman data. A dynamic churning economy is a mixture of benefits for firms and their workers on the rise and costs for firms and their workers who are on the downside. But from an overall perspective, it also represents a shift in resources away from firms producing goods and services that not enough people want to buy, or goods and service that aren't being produced at a competitive levels of price and quality. Instead, those resources of workers and capital investment are moving to firms producing the goods and services with the desired mix of price and quality that people do want to purchase. I have argued from time to time that the government could play a larger role in facilitating, or at least not blocking, this process of dynamic movement--especially by assisting workers in transition. But overall, this dynamic process of economic reallocation has been one of the strengths of the US economy, and it is troublesome to see signs that it may be diminishing. It seems as if there's always a majority against the way things are. In a world full of problems and issues, how could it be otherwise? It's why politicians are always calling for "change," which strikes me as a slogan that is appealing and concealing in equal measure. Because the real-world problem that arises is when those who are united in their opposition to the way things, and united in favor of "change," need to offer an actual alternative of their own. When advocating for change, problems and policies are the target. But if you advocate an actual policy, with inevitable costs and tradeoffs, then you become the target. Consider the mess that has resulted from Brexit -- that is, the June 2016 vote in the United Kingdom to leave the European Union. There was (at least at the time) a majority in the UK in favor of leaving the EU. However, there is also apparently a majority against the "hard exit" option of crashing out of the EU without a replacement trade agreement in place. And there is a strong majority against Prime Minister Theresa May's actual concrete plan for a substitute trade agreement. Sure, there are a variety of other proposals for substitute trade agreement bubbling around. But the EU must also sign on to any substitute agreement. and the EU has an incentive to make it hard and disruptive for any of its members to exit, So it seems plausible to me that there would be a majority against any plausible substitute for May's proposal, too. Easy to be opposed. Easy to advocate "change." But what should the UK do when there is a majority against any achievable policy? Or consider health care financing in the US. A long-standing bipartisan majority has pointed out problems with the high cost of US health care by international standards, and with the number of people who lack health insurance. But calling for "change" is easy, and advocating a policy is hard. When Democrats controlled the Presidency and Congress in 2010, they managed to wedge through the Patient Protection and Affordable Care Act of 2010. Of course, this new reality immediately became the new target. When Republicans controlled the Presidency and Congress in 2017 and 2018 were unified in expressing their opposition to the 2010 law, but unable to cobble together a bare majority that would wedge through an alternative plan. Meanwhile, most prominent Democrats seem to believe that the flaws of the 2010 legislation are quite sweeping, and thus require enacting a new and substantial set of changes. But when it comes to like whether private health insurance should be shut down in favor of a single-payer government plan like "Medicare for All," my guess is that the Democratic coalition in favor of "change" would splinter, too. "Time was, socialism meant thorough collectivism: state ownership of the means of production (including arable land), distribution, and exchange. When this did not go swimmingly where it was first tried, Lenin said (in 1922) that socialism meant government ownership of the economy’s “commanding heights” — big entities. After many subsequent dilutions, today’s watery conceptions of socialism amount to this: Almost everyone will be nice to almost everyone, using money taken from a few. This means having government distribute, according to its conception of equity, the wealth produced by capitalism. This conception is shaped by muscular factions: the elderly, government employees unions, the steel industry, the sugar growers, and so on and on and on. Some wealth is distributed to the poor; most goes to the “neglected” middle class. Some neglect: The political class talks of little else." This lack of clarity becomes a problem when advocates of socialism stop targeting the undoubted ills of society and instead propose actual changes of their own--thus making themselves the target for others. Agreeing on a critique, on opposing, on change, is easy. Agreeing on alternatives is hard. Will quotes an old political proverb: "Two American socialists equals three factions." It's useful to point out social problems. But when those problems are long-standing and fairly well-known, pointing them out again and again offers little additional benefit. In my mind, calling for "change" is not very meaningful without saying what change is actually desired. Indeed, when someone points out a problem, I don't even know whether they are doing so in a constructive or a destructive spirit until I have some sense of their preferred alternatives. Calls for "change" can be intoxicating. But it feels to me that we have a tendency to lionize those who are uncompromising in their criticisms, in a way that makes it harder for those who are trying to work through costs and tradeoffs to enunciate a policy with practical gains. directly are in 2008, 2010, and 2015. The authors explain: "To measure GNH, a profile is created for each person showing in which of 33 grouped indicators (formed from the abovementioned 124 indicator variables) the person has achieved sufficiency. As noted by the Gross National Happiness Commission (2015), not all people need to be sufficient in each of the 124 variables to be happy. Accordingly, in tabulating the Survey results the Commission divides Bhutanese into four groups depending on their degree of happiness, using three cutoffs: 50%, 66% and 77%." 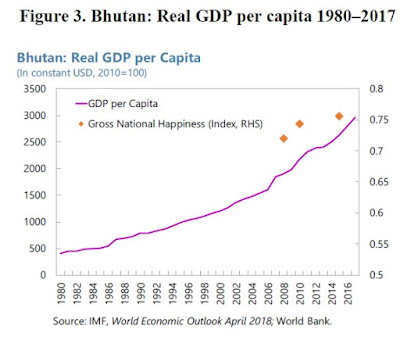 Thus, a comparison between growth of per capita GDP in Bhutan and the Gross National Happiness Index for these three years looks like this. From 1980 to 2017, Bhutan's per capita GDP rose by a factor of 6, thanks in part to the development of its energy sector and to expanding trade ties with India. But given the data, it doesn't seem possible to say if Gross National Happiness has also risen sixfold. There are also survey measures of happiness, in which people are asked to rank their own level of happiness: for example, in the World Happiness Repot 2018, "the happiness ranking of Bhutan fell from 84th (2013–15) in the world to 97th (2015–17) out of 156 countries." So what are we to make of Bhutan's Gross National Happiness? 1) It is bog standard economics that GDP was never intended to measure happiness, nor to measure broader social welfare. Any intro econ textbook makes the point. A well-known comment from "Robert Kennedy on Shortcomings of GDP in 1968" (January 30, 2012) make the point more poetically. 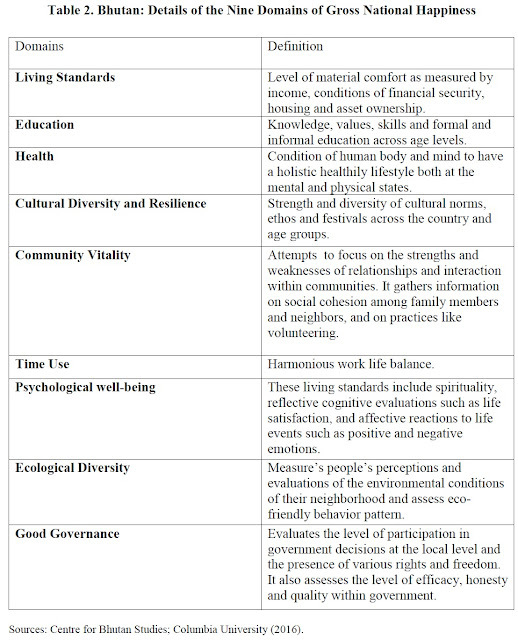 But for those who need a reminder that social welfare is based on a wide variety of outcomes, not just GDP, I suppose a reminder about Gross National Happiness might be useful. 2) Bhutan's measurement of 124 weighted indicator variables, and their distribution through the population, is probably about as good a way of measuring Gross National Happiness as any other, and better than some. But it's also pretty arbitrary in its own way. 3) The interesting question about GDP and social welfare isn't whether they are identical, but whether they tend to rise together in a broad sense. For example, countries with higher per capita income also tend to have more education and health care, better housing and nutrition, more participatory governance, and a variety of other good things. .A few years ago I wrote about "GDP and Social Welfare in the Long Run" (April 6, 2015), or see "Why GDP Growth is Good" (October 11, 2012). 4) "Happiness" is of course a tricky subject, which is why it's the stuff of literature and love. After a lot of consideration, Daniel Kahneman has argued that "people don't want to be happy." Instead, they want to have a satisfactory narrative that they can tell themselves about how their life is unfolding. If incomes, education, and life expectancy rise over, say, 40-50 years but on a scale of 1-10 people don't express greater "happiness" with their live, does that really mean they would be equally happy with lower incomes, education and life expectancy--especially if other countries in the world were continuing to make gains on these dimensions? There is an ongoing argument over whether those who have higher income express more happiness because they get to consume more, or because they feel good about comparing themselves who are worse off. It's easy to say that "money doesn't bring happiness," and there's some truth in the claim. But for most of us, if we lived in a country with lower income levels and could watch the rest of the world through the internet and television, it would bug us at least a little, now and then. 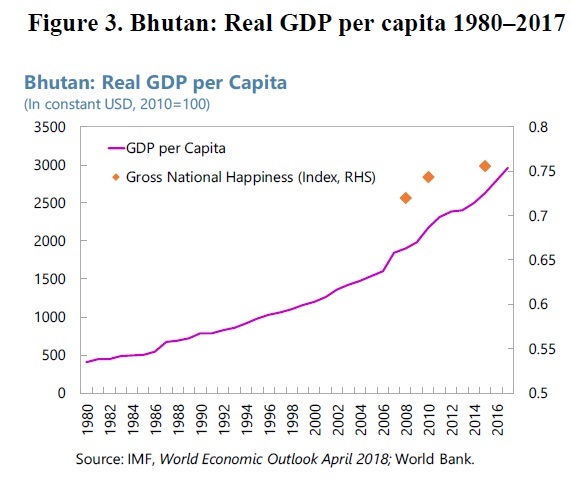 It seems to me easy enough to make the case that looking at Gross National Happiness as is better than an exclusive focus on doing nothing but boosting short-term GDP. But outside the fictional mustachio-twirling econo-villains of anti-capitalist comic books, no one actually believes in an exclusive focus on GDP. For me as an outsider, it's hard to see how Gross National Happiness has made Bhutan's development strategy different. After all, lots of countries at all income levels emphasize lots of goals other than short-term GDP. And the government of Bhutan pays considerable attention to GDP, as the authors note, "While there is importance given to GNH in Bhutan, governmental organizations (especially commerce related ones) focus keen attention on GDP and how it measures trade, commerce and the economic prosperity of the country. In addition, the IMF has provided a great deal of technical assistance to Bhutan to help improve its national accounts ..."
My own favorite comment on the connection from GDP to social welfare is from a 1986 essay by Robert Solow ("James Meade at Eighty," Economic Journal, December 1986, pp. 986-988), where he wrote: "If you have to be obsessed by something, maximizing real National Income is not a bad choice." At least to me, the clear implication is that it's perhaps better not to be obsessed by one number, and instead to cultivate a broader and multidimensional perspective. If you want to refer to that mix of statistics as Gross National Happiness, no harm is done. But yes, if you need to pick one number out of all the rest (and again, you don't! ), real per capita GDP isn't a bad choice. To put it another way, a high or rising GDP certainly doesn't assure a high level of social welfare, but it makes it easier to accomplish those goals than a low and falling GDP. The big selling points for a universal basic income are simplicity and work incentives. The simplicity arises because with a universal basic income, there are no qualifications to satisfy or forms to fill out. People just receive it, regardless of factors like income levels or whether they have a job. There are not bureaucratic costs of determining eligibility, and no stigma of applying for such benefits or in receiving them. The gains for work incentives arise because many programs aimed at helping the poor have a built-in feature that as you earn more on the job, you receive less in government assistance. From one standpoint, this seems logical and fair. But economists have been quick to point out that if someone loses a dollar of government benefits every time they gain a dollar from working, the implicit tax rate is 100%. When there are a number of different programs aimed at the working poor, all phasing out on their own individual schedules as income rises, the result can be that low-income people face very high implicit tax rates--even in some situations close to 100%. But a universal basic income does not decline or phase out as someone earns more income. There are plenty of assertions about how a universal basic income would affect work incentives, but actual hard evidence is still accumulating. The province of Ontario announced that it would run a three- year experiment, but then cancelled it after one year. An organization called GiveDirectly is running a universal basic income experiment in Kenya, although results aren't available yet, but there is reason to be skeptical as to whether the cost and effects of such a program in a low-income country will offer natural lessons for high-income countries. A firm called YCombinator is planning to run a universal basic income experiment in two US cities starting in 2019, but details still seem sketchy. The city of Stockton in California has just started an experiment where 130 people will get monthly payments of $500 for the next 18 months. The program in Alaska in which residents get a payment from the state based on oil royalties, typically $1000-$2000 per year, can be viewed as a form of a universal basic income, although it's clearly not enough to live on by itself. "[T]he amount of basic income was 560 euros per month. This corresponded to the monthly net amount of the basic unemployment allowance and the labour market subsidy provided by Kela (the Social Insurance Institution of Finland). Two thousand persons aged 25–58 years who received an unemployment benefit from Kela in November 2016 were selected for the actual experiment. They were selected through random sampling without any regional or other emphasis. ... Despite its deficiencies, the Finnish experiment is exceptional from an international perspective in that participation in the experiment was compulsory and it was designed as a randomised field experiment." Of the persons who in November 2016 received an unemployment benefit from Kela, 57 per cent had no earnings or income from self-employment in 2017. The figures also reveal that the average income of those who had been in employment was only around 9,920 euros. ... [T]he experiment did not have any effect on employment status during the first year of the experiment. The number of annual days in employment for the group that received a basic income is on average about half a day higher than for the control group. Overall, receipt of any positive earnings or income from self-employment, either from the open labour market or the subsidised labour market, is about one percentage point more common in the treatment group. However, resulting earnings and incomes from self-employment turned out to be 21 euros smaller. In other results based on phone surveys, those who received the universal basic income expressed greater confident in their own future, and they expressed a belief that it would be easier to accept a future job offer. It will be interesting to see if these attitudes lead to actually higher employment as the 2018 data becomes available . It's important to note that like all practical experiments, the Finnish experiment was not a completely pure universal basic income. For example, the experiment targeted the long-term unemployed, not the working poor as a group, and those receiving the benefit still dealt with the government for other support programs, like housing assistance. In adidtion, the experiment would need to be considered in the context of Finland's overall labor market. So the results are preliminary in a number of ways. But it's hard to spin them as encouraging. For those who would like a bunch of links to discussion of the Finnish experiment and broader recent discussions of a universal basic income, a useful starting point is the extended blog post at the Brueghel website by Catarina Midoes, "Universal basic income and the Finnish experiment" (February 18, 2019). For a pragmatic discussion of how a true universal basic income--that is, a payment to everyone that does not phase out regardless of income--might work in a US context, interested readers might start with Universal Basic Income: A Thought Experiment" (July 29, 2014). If one took all the money from US (nonhealth) antipoverty programs, as well as a number of tax breaks that tend to benefit the middle-and upper-class, one could fund a universal basic income for the US of about $5800 per year. 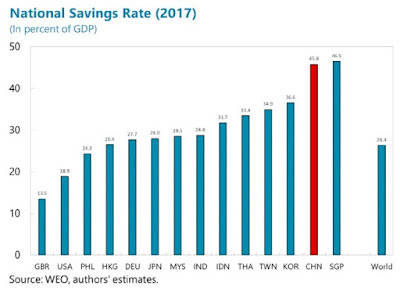 China has a remarkably high savings rate in a typical year--and sometimes its higher than that. In fact, the main reason for China's high trade surpluses is that with such a high savings rate, China doesn't consume either a lot of imports or domestically produced goods. A reason that China can invest so much, year after year, is that the investment is financed by high savings rates. A standard recommendation for China's economy for at least the last 15 years or so is to "rebalance" toward being an economy driven by domestic consumption, not by investment. To get a sense of what these high rates of saving imply for the mixture of consumption and investment in aneconomy, consider this figure. The horizontal axis shows a country's level of consumption; the vertical axis shows its level of fixed capital investment. 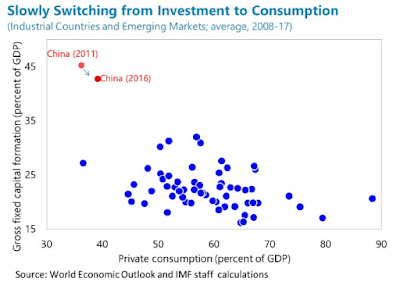 China is way in the upper left, with low consumption and high investment,. The authors write: "With GDP per capita in PPP terms being similar to Brazil’s, consumption per capita in China is only comparable to Nigeria. If Chinese households consumed comparably to Brazilian households, their consumption levels would be more than double." One sometimes hears saying applied to China: "Country rich, people poor." The high savings rate is why it can feel that way. "Household savings in China have been trending up since the early 1990s and peaked at 25 percent in 2010 and moderated slightly in recent years. Globally, household savings have been falling (from 14 percent of GDP in 1980 to about 7 percent today). The diverging trend has led to an increasing gap between China and the rest of the world. 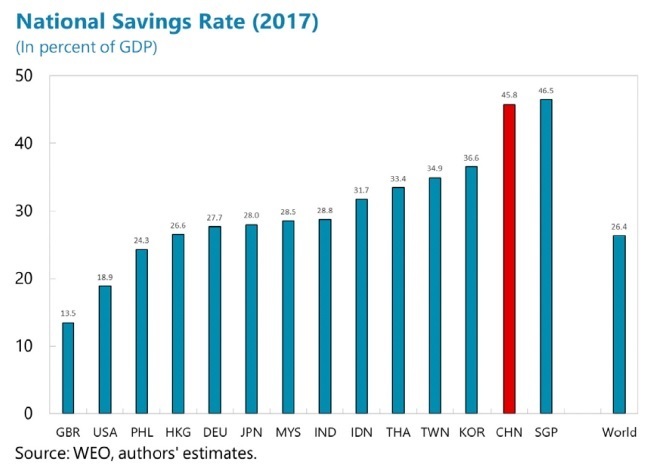 At 23 percent of GDP, today China’s household savings are 15 percentage points higher than the global average and constitute the main drivers of higher national savings in China." Low birthrates and the one-child policy meant less need to spend on children, but less ability to rely on children in retirement--and thus an incentive for more saving. This can explain perhaps half of the rise in China's household savings rate in recent decades. For example, the health care coverage of urban workers declined by 17 percentage points between 1990 and 2000. Furthermore, the average replacement rate for urban workers (pension benefits in percent of wages) dropped sharply from close to 80 percent to below 50 percent (He at al., 2017). Nationwide, individuals have been paying increasingly larger shares of healthcare expenditures out of pocket, rising from 20 percent in 1978 to a peak of 60 percent in 2000. In addition, households also began paying more for education out of their own pocket, rising from 2 percent in 1990 to 13 percent in 2001. Households saved so that they could invest in housing, both as a store of wealth and as an investment that has delivered high returns in the last 15-20 years. Up until just a few years ago, the options for making financial investments were fairly limited. Interest rates were controlled, and many people didn't have access to a wide range of other financial instruments. So if you wanted to accumulate a certain level of wealth by retirement, and your financial options paid only low interest rates, you had to save a lot. East Asian economies experienced a rapid decline in household savings after the peak. Japan’s household savings rate peaked in 1974 at about 25 percent and has fallen to almost zero. In Korea, household savings peaked in the early 1990s at 27 percent, and are at about 15 percent today. Similarly, household savings in Taiwan POC also fell rapidly after peaking in 1993 at about 30 percent, although they stabilized a decade later at about 20 percent. Household savings in these countries or areas peaked at income levels similar to China’s, suggesting that the stage of development plays an important role in savings dynamics. In addition, microdata suggest that the decline in aggregate household savings in those countries or areas was driven by lower savings rates across all income deciles, although the drop was much more pronounced for low-income households, likely reflecting the improvement in social safety nets. With the aging population and strengthening of the social safety net, China is likely to follow the regional trend. As China's population ages, household savings rates will decline and public pressures for more spending on pensions and health care will rise. 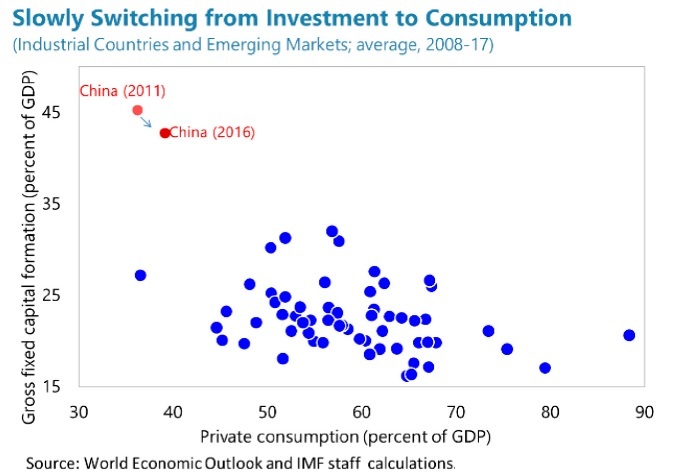 Thus, the movement to lower savings rates could be reinforced if China's government shifted its pattern of spending from investment-heavy to more consumption-heavy. Here's a figure showing public investment as a share of GDP across a number of countries. And here's a figure showing government spending on consumption-related areas like health, education, social assistance, and pensions. 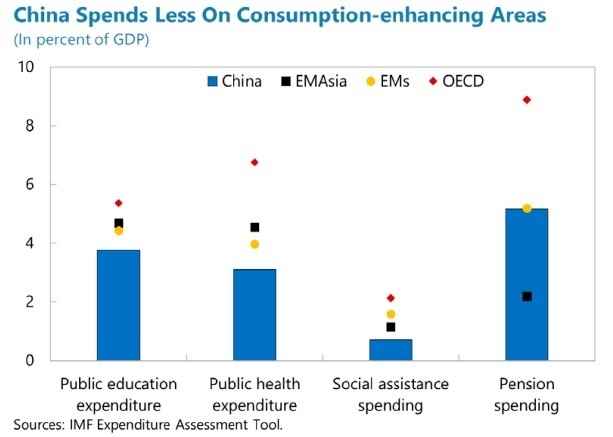 The red diamond shows average levels of spending in these areas as a share of GDP for OECD countries. The yellow diamonds show the average for emerging markets around the world. 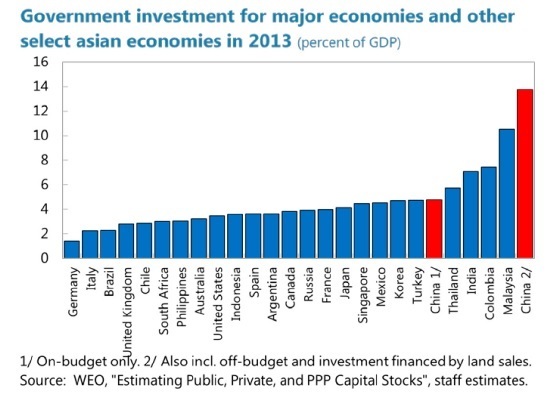 The blue bars show China. . In a low-saving, low-investment economy like the US, it's a little hard to conceive that its possible for savings and investment rates to be too high for a country's economic health. But that's where China has been, and shifting away from established patterns is rarely simple. Jessie Romero tells the story in "Leaving LIBOR: The Fed has developed a new reference rate to replace the troubled LIBOR. Will banks make the switch?" which appears in Econ Focus from the Federal Reserve Bank of Richmond (Third Quarter 2018). LIBOR is based on how much banks pay to borrow from one another. Each day, a panel of 20 international banks responds to the question, "At what rate could you borrow funds, were you to do so by asking for and then accepting interbank offers in a reasonable market size just prior to 11 a.m.?" The highest and lowest responses are excluded, and the remaining responses are averaged. Not every bank responds for every currency; 11 banks report for the franc, while 16 banks report for the dollar and the pound. For each of the five currencies, LIBOR is published for seven different maturities, ranging from overnight to 12 months. In total, 35 rates are published every applicable London business day. About 95 percent of the outstanding contracts based on LIBOR are for derivatives. (See chart below.) It's also used as a reference for other securities and for variable rate loans, such as private student loans and adjustable-rate mortgages (ARMs). In 2012, the Cleveland Fed calculated that about 80 percent of subprime ARMs were indexed to LIBOR, as well as about 45 percent of prime ARMs. Prior to the financial crisis, essentially all subprime ARMs were linked to LIBOR. As regulators investigated ... [b]eginning at least in 2003, banks had been submitting LIBOR reports that would benefit their trading positions. Rate submitters and traders at different banks and brokerages also conspired with each other to manipulate LIBOR, promising each other steaks, Champagne, and Ferraris (among other perks). Internal emails and instant messages revealed the scheme. As one trader wrote, "Sorry to be a pain but just to remind you the importance of a low fixing for us today." Another wondered "if it suits you guys on hiking up 1bp on the 6mth Libor in JPY [one basis point on the six- month LIBOR in Japanese yen] ... it will help our position tremendously." At least 11 financial institutions faced fines and criminal charges from multiple international agencies, including the Commodity Futures Trading Commission (CFTC) and the Justice Department in the United States. Separately, in 2014 the FDIC sued 16 global banks for manipulating LIBOR, alleging that their actions had caused "substantial losses" for nearly 40 banks that went bankrupt during the financial crisis. Although LIBOR has continued under stricter management, it seems clear that it was a bad idea to have a benchmark interest rate determined by answers to a survey. Instead, the challenge was to choose an interest rate for very safe borrowing--remember, LIBOR was banks borrowing from each other for very short terms, including overnight--but determined in a market that had lots of liquidity and volume. Various groups of brainiacs tackles the problem. As one example from a few years ago in 2015, Darrell Duffie and Jeremy C. Stein surveyed the possible options in "Reforming LIBOR and Other Financial Market Benchmarks" published in the Journal of Economic Perspectives (29 (2): 191-212). Eventually an Alternative Reference Rates Committee was convened by the Federal Reserve, with representation from both government agencies and the private sector, and it published its recommendation in a March 2018 report. Bottom line: It recommends using the SOFR as the preferred benchmark interest rate, which stands for Secured Overnight Financing Rate. It refers to the cost of borrowing which is extremely safe, because the borrowing is only overnight, and there are Treasury securities used as collateral for rthe borrowing. The SOFR rate is based on a market with about $800 billion in daily transactions, and this kind of overnight borrowing doesn't just include banks, but covers a wider range of financial institutions. The New York Fed publishes the SOFR rate every morning at 8 eastern time. But perhaps the best reason for using SOFR is that an agreed-upon benchmark interest rate is needed, and LIBOR is going away. As Romero reports, banks have been trying to duck out of answering the LIBOR survey for a few years now, and have continued to participate only because of threats from regulators. After all, with hundreds of trillions of financial contracts using LIBOR, it was important for the stability of global financial markets that the reference rate didn't become volatile or vanish altogether. But by around 2021, the financial regulators are ready to let LIBOR die. New financial contracts are often now being written with SOFR, instead. For most of us, the shift from LIBOR to SOFR doesn't affect our daily lives. But when you are discussing a risk-free interest rate, or a benchmark interest rate for a contract or mortgage with adjustable rates, you are soon going to stop hearing about LIBOR. For practical purposes, just remember that SOFR serves the same benchmark interest rate function. Here's an op-ed piece by me that was published on the editorial page of the local Star Tribune newspaper yesterday, February 17. What it is, why it's not socialism, and what we in the U.S. might be surprised to learn about it. Outside an H&M store in Stockholm, the Swedish capital. The country is capitalist, but Scandinavian capitalism is different from that in the United States. But most people who talk a socialist game, when asked for real-world examples, tend to sidestep the more extreme (and less attractive) possibilities and point to European countries — in particular, to Northern European countries like Sweden, Denmark, Norway and sometimes Finland. If we want to avoid quibbling over the s-word and instead just refer to a Scandinavian style of capitalism, what are some of its key elements? The question is tricky, because the Scandinavian style of capitalism has gone through several stages in the last 50 years or so. In a 1997 article, the prominent Swedish economist Assar Lindbeck described how in the decades after World War II Sweden had a growing economy, generous public services, full employment and a fairly equal distribution of income. But this was followed by slower growth in the 1970s and a collapse of full employment and rise of inequality by the early 1990s. In short, the Swedes themselves didn’t think the Scandinavian model of capitalism was working all that well in the 1980s and early 1990s, and they carried out a hardheaded redesign. For example, there was a broad recognition that as a small, market-oriented economy open to international trade, Sweden needed healthy companies and skilled workers, so top tax rates were rolled back. Many government benefit programs were redesigned and rolled back. A ceiling was put on public spending. Sweden’s ratio of national debt to GDP fell from 80 percent in 1995 to 41 percent in 2017. The U.S. system of capitalism relies on financial incentives to encourage work. In the Scandinavian model of capitalism, high taxes reduce the financial incentive to work but pay for social services that encourage work. The resulting higher tax burden is substantial. The total tax burden in the Scandinavian countries is almost half of GDP, while the combined spending of all U.S. levels of government is about 38 percent of GDP. In addition, the Scandinavian countries impose a value-added tax of 24 or 25 percent on purchases. (A VAT functions like a sales tax, although it is collected from producers rather than at the point of sale.) The CEA report notes that, as a result, taxation of households in the Scandinavian economies is overall less progressive than in the U.S. The Scandinavian model of capitalism has more equal economic outcomes. But for advocates for a higher U.S. minimum wage, it’s perhaps worth noting that the Scandinavian countries do not have minimum wage laws. However, rates of unionization are typically 70-90 percent of the workforce in Norway, Denmark and Sweden, as opposed to about 11 percent of the U.S. workforce. Negotiating pressure from these unions is a powerful reason for the greater equality of wages and benefits for labor. Last fall, New York Times columnist Paul Krugman illustrated the greater economic equality in Scandinavian countries by citing estimates of income levels for people at different points in the income distribution. This comparison looks at income after taxes are paid and transfer payments are received. A low-income person at the 10-20th income percentile in Denmark or Finland has an income about 20 percent higher than an American’s at that place in the U.S. income distribution. But among middle-income people in the 55th-60th percentile of the income distribution, incomes in Denmark and Finland are 20 percent below those of the similar person in the U.S. income distribution. Overall, average income levels are about 20 percent higher in the United States. • In the early 1990s, Sweden set up its equivalent of the K-12 school system so that parents have vouchers that can be used at public, private and for-profit schools. • College tuition in the Nordic countries is free to the student. However, college graduates in these countries don’t earn substantially higher wages. As a result, Americans are more likely to attend college, even needing to pay for it. • The Scandinavian countries have national programs of health insurance coverage, but with substantial co-payments. For example, data from the Organization for Economic Cooperation and Development (OECD) suggest that out-of-pocket health care spending is only a little lower in Norway than in the United States. • Although the Scandinavian countries have greater government regulation of labor markets than the U.S., they tend to have lower levels of regulation for product markets and companies. • Sweden’s social security system is based on mandatory contributions to individual accounts, with people having a wide range of several hundred possible investment options for their accounts, or a default fund mostly invested in stocks. Whether these various aspects of the Scandinavian model appeal, or not, it’s worth remembering what works in one country may not transplant easily. After all, the combined population of Sweden (10 million) Denmark (5.8 million) and Norway (5.3 million) is roughly comparable to that of the greater New York City metropolitan area, and rather less diverse. The Nordic countries have intimate economic and regulatory ties with the much larger European Union. However, Sweden, Norway and Denmark have kept their own currencies and don’t use the euro. It seems inaccurate to me to label the Scandinavian model of capitalism as “socialism,” but arguing over definitions of imprecise and emotionally charged terms is a waste of breath. What does bother me is when the “socialist” label becomes a substitute for actually studying the details of how different varieties of capitalism have functioned and malfunctioned, with an eye to what concrete lessons can be learned. Timothy Taylor is managing editor of the Journal of Economic Perspectives, based at Macalester College. 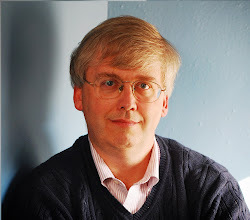 He blogs at http://conversableeconomist.blogspot.com. Note: Regular readers of this blog may recognize this op-ed as a tightened-up version of the blog post from last year, "The Scandinavian Style of Capitalism" (November 5, 2018). There are additional links, quotations, and detail in that post. explained and questioning the motives of the parent company, Panera Bread. . ... Overall, this questioning of the motives and tactics of Panera Cares (a nonprofit) may be intensified because of the close connection it has to its for-profit parent company Panera Bread. Lee et al. (2017) argue that the distinction between companies that have a social mission versus those who have a profit mission is salient for consumers, and in the case of Panera Cares and Bread, is not clear. A nonprofit orientation can paradoxically drive consumer perception of organizational greed. This is because communal norms rather than exchange norms are invoked by consumers, and any perceived breach of communal norms is seen as an indication of greed. As we saw with customers using terms like tax haven and marketing gimmick to describe Panera Cares, this effect seems to be at play here. "Liberty is liberty, and is meaningless by parts." The central misconception is to think that one can claim the honorable title of “liberal” if one approves of one form of liberty, such as mutual consent in sexual partners or the ability to drill for oil where you wish, but excludes the other form. Liberty is liberty, and is meaningless by parts. You are still a slave if only on odd days of the month. I used to think freedom was freedom of speech, freedom of the press, freedom of conscience. Here is what it amounts to: you have to have the right to sow what you wish to, to make shoes or coats, to bake into bread the flour ground from the grain you have sown, and to sell it or not sell it as you wish; for the lathe-operator, the steelworker, and the artist it’s a matter of being able to live as you wish and work as you wish and not as they order you. "Put me down for 10 percent slavery to government." So here’s what a Liberalism 2.0 favors. It favors a social safety net, which is to say a clean transfer of money from you and me to the very poor in distress, a hand up so they can take care of their families. It favors financing pre- and post-natal care and nursery schools for poor kids, which would do more to raise health and educational standards than almost anything we can do later. It favors compulsory measles vaccination, to prevent the big spillover of contagion that is happening now in Clark County, Washington. It favors compulsory school attendance, financed by you and me, though not the socialized provision of public schools. The Swedes have since the 1990s had a national voucher system, liberal-style. It favors a small army/coast-guard to protect as against the imminent threat of invasion by Canada and Mexico, and a pile of nuclear weapons and delivery systems to prevent the Russians or Chinese or North Koreans from extorting us. All this is good, and would result in the government at all levels taking and regulating perhaps 10 percent of the nation’s production. Put me down for 10 percent slavery to government. Not the 30 to 55 percent at present that rich countries enslave. "The Nordics ... are not thoroughly socialist, and in fact they are reasonably close to the U.S., and in some ways more anti-socialist." Americans of good will have long been persuaded, on the basis of breathless articles in the Sunday New York Times Magazine, that the Nordics are thoroughly “socialist” ... No, they are not thoroughly socialist, and in fact they are reasonably close to the U.S., and in some ways more anti-socialist. They are in fact highly liberal in their economies (and their fastest rates of growth since 1850 were in fact when they were even more liberal). Almost all prices in Sweden and the rest, for example, are determined by supply and demand, and are nothing like the disastrous socialist interventions by way of price controls in, say, Venezuela. Setting up a business is not hard. Inherited wealth in Scandinavia and Finland is not honored. Innovation is (for example Svenska Kullagerfabriken, SKF, a pioneer in ball bearings, out of which in the 1920s rolled Volvo [Latin for “I roll”]). And government ownership of the means of production is trivial in all the Nordic countries. When Saab Motors went bankrupt, it came to the Swedish government hat in hand, and the government said, “Get lost.” When Volvo recently became a Chinese company, the government said, “So what?” You don’t have to exercise much imagination about what the American government would do if General Motors was so threatened: “Here are billions of tax dollars, and so the Federal Government owns part of you.” The American government in 2008 of course did precisely that. "Give this gentleman sixteen cents. That’s his share of the wealth." [Andrew] Carnegie himself is said to have made the same point in another way. A socialist came to his office and argued to him that the wealthy should redistribute their wealth to the poor of the earth. Carnegie asked an assistant to go get him a rough estimate of his current wealth and of the population of the earth. The assistant returned shortly with the figures, and according to the anecdote Carnegie performed a calculation, then turned to the assistant and said, “Give this gentleman sixteen cents. That’s his share of the wealth.” And then he gave every dime of his wealth away, in accord with his Gospel of Wealth. Another businesslike Scot, Adam Smith, by the way, also gave away his considerable fortune, though, unlike Carnegie, he did not sound a trumpet before him when he did his alms. Modern scholars are also deeply divided on guilds. Some claim that guilds were so widespread and long-lived that they must have generated economic benefits. They might, for example, have solved information asymmetries between producers and consumers, overcome imperfections in markets for human capital, created incentive favoring innovation, put pressure on governments to be business-friendly, or generated social harmony by reducing competition, conflict, and inequality. Other scholars take a darker view. Guilds, they hold, were in a position to extract benefits for their own members by acting as cartels, exploiting consumers, rationing access to human capital investment, stifling innovation, bribing governments for favours, harming outsiders such as women, Jews, or the poor, and redistributing resources to their members at the expense of the wider community. As this book will show, my own reading of the evidence is that a common theme underlies guilds' activities: guilds tended to do what was best for guild members. In some cases, what guilds did brought certain benefits to the broader public. But overall, the actions guilds took mainly had the effect of protecting and enriching their members at the expense of consumers and non-members; reducing threats from innovators, competitors, and audacious upstarts; and generating sufficient rents to pay off the political elites that enforced the guilds' privileges and might otherwise have interfered with them. Of course, the issues raised by the medieval guilds have continuing economic relevance. There are continuing efforts to reduce competition, through method ranging from occupational licensing to trade tariffs, always based on the claim that setting the stage for a certain group of producers to receive higher profits is actually in the interest of society as a whole. This broad argument is probably true in a few cases: for example, patents restrain competition for a period of time, but by allowing innovators to earn higher profits they also provide incentives for innovation. But in many cases, including guilds, a cycle forms in which government helps certain producers receive higher profits, and then a share of those profits goes to helping government officials reach the conclusion that favoring one set of producers over consumers and other producers is a socially important goal.